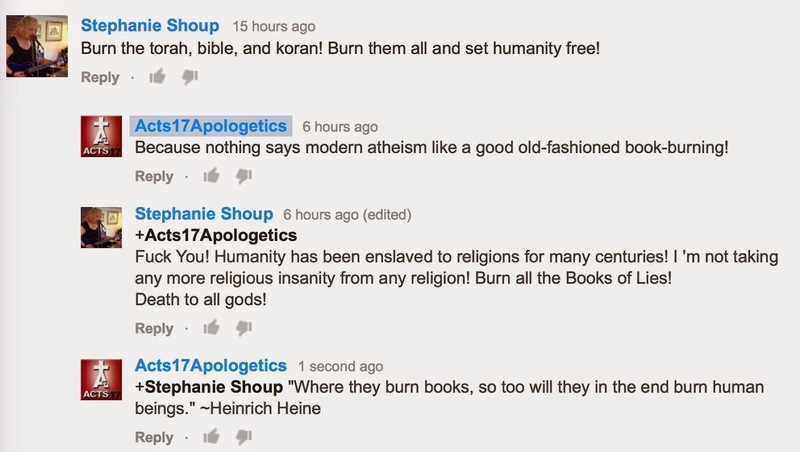 I posted here about an atheist calling for book burnings, and here about atheists saying that people who believe in God should be wiped out or quarantined. Here's another atheist calling for book burnings. If this comment had come from a Christian, atheists would point to it as clear proof that religion breeds radicalism. But since it comes from an atheist, it's no evidence of anything. Welcome to the amazing world of double standards. David, could you blur/black out the vulgarities just in case little eyes are around? Speaking on the subject, when I confront atheists with the death counts of all of the various explicitly atheist regimes have accrued and the relatively short time frame it happened over, they tend to try to discriminate between totalitarian atheist governments and more libertarian governments, often throwing in that the reason totalitarian atheist governments are so terrible is because they build up a cult of personality that mimics religion so well (never mind that the folks I'm debating are usually quite loyal to Dawkins, Harris, Mahr, that guy who plays The Amazing Atheist, and the latest sacred cow, whatever his name is from the remake of cosmos. Tyson Chicken or something?). They do this even though a few moments earlier, they're hurling the genetic fallacy faster than Usain Bolt, are content to paint with a broad brush borrowed from religious pluralism, and weren't in the habit of discriminating between, say, cults like Jehova's Witnesses or sects like Quakers or Jainism who are absolutist pacifist extremists and the Catholic Church's, Puritans', and Islam's various romps through infamy. I usually just give up at that point, because it's obvious that I'm talking to someone who can't even be as honest as Nietzsche was, but I was wondering what the proper strategy is to make genuine progress with atheists in that case. The usual response when I bring up the atheistic regimes' death tolls, I get the old "They didn't kill in the name of atheism" line. Lung cancer doesn't kill in the name of Marlboro either. Why they kill is less important than the fact that they reliably do. About two thirds of atheist regimes kill large numbers of their own people. But don't those regimes, again, set up an explicitly anti-theist regime that seeks to either eliminate religion from both the market place of ideas, the public square, AND the home and/or control it so that folks don't start getting uppity and causing troubles? By that point, do you usually bring up the fact that, if death tolls somehow proved against what a particular religion or ideology, then by the atheist's own metric, atheism must wrong because of that? After all, the atheist has admitted that atheists have killed tons of people by this point, and isn't the whole point behind bringing up atheist death-tolls supposed to show that the atheist's metric is a shallow, emotive, and illogical genetic fallacy to the point where, if Hitler said grass was green, said atheist would have to say that Hitler was wrong just because it's Hitler saying it (assuming of course, said atheist isn't a neo-Nazi). There isn't evidence of anything because atheism has no dogma. "There isn't evidence of anything because atheism has no dogma." Wow! Let's go with the first part: "There isn't evidence of anything." So there's literally no evidence for anything anywhere? Finally, a genuine skeptic! Interesting that you reject all science, history, etc., since they all rely on logic. As for the next part, "atheism has no dogma," what about the dogma that God doesn't exist? If atheism doesn't even include that, why use the term at all? Actually, I think most, or close to all, self proclaimed "atheists" are not really atheist. They are anti-theist. A true atheist cares not if you have or promote a God. A true atheist would not feel a need to proclaim that they don't believe in a religion. Why bother? A true atheist realizes that in many cases religion, even though untrue, plays a vital role in psychologically helping a believer. A true atheists will often encourage a theist to have whatever believe they desire, if it helps them to be a better person. An anti-theist, on the complete other side of the spectrum, will argue in attempts to make you stop believing. 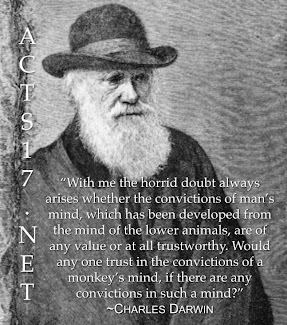 They dislike any theist concepts, and work hard to stop believers from believing. They use tools such as quotes, questions, sarcasm, scientific facts, and down right insults, in an attempt to stop others from believing too. Hi nothing good come from burning the book . But Will be good if we study all the book and find the truth . Btw :thanks for all what to do i felling free from the Islam after I accept Jesus as my savers . Thanks to help me to see the truth. Hi Asma! Great to year you've accepted Jesus. You can contact me here: wood_apologetics@hotmail.com. God bless you!